The Samsung Galaxy S6 and Samsung Galaxy S6 edge will both be launched around the world. 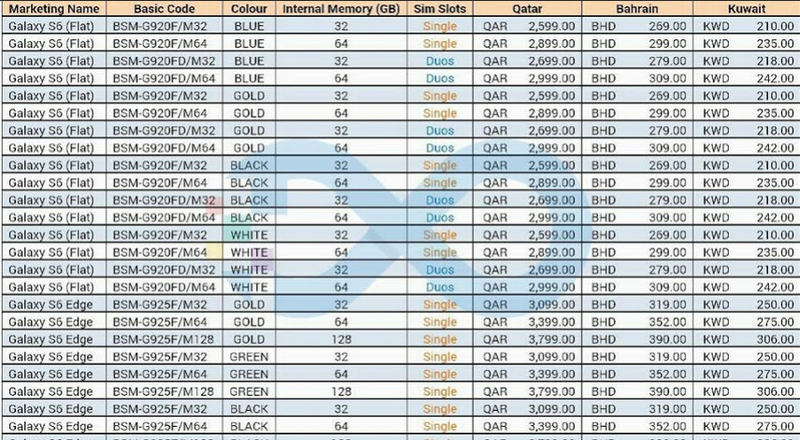 Today, pricing for different variants of the new models was leaked for Qatar, Bahrain and Kuwait. The pricing includes both single SIM and dual SIM versions of the Galaxy S6. The latter phone comes in both 32GB and 64GB variants. As for the Galaxy S6 edge, pricing is divided by the 32GB, 64GB and 128GB versions of the premium model. While this only gives us a rough example of what the U.S. pricing will be for these models, we should have a better handle on what the new Samsung Galaxy S6 will cost in the states on April 1st when Verizon starts taking pre-orders for the device. Exactly. The worst part is no phone costs more than $300 to make. We pay 300% more than the device costs to manufacture. Thats disgusting to me. What disadvantages? That was a glowing review. 300$ is the price of components, not the price it takes to make the decide. A device needs software and a kernel to be made, lot of R&D has to be done, there's marketing and the latest parts cost more. This is not a simple phone like one plus one which had CyanogemMod made for it for free, it had 0 marketing and R&D too as every spec in that phone was previously used and as they were there for quite a time, those parts were cheaper. If one plus makes a phone with S6 specs now, it'll be a lot more expensive than 350$. Look at xiaomi mi note pro. It costs 597$ outside China and that doesn't quite match up to S6 or M9. Galaxy s5 costs 450$ here now. Not a bad deal huh. It's not disgusting. They have to get profit and pay people. Also Google services on android are not free. You have to pay for them. All in all, making a phone is a lot more then the price of components. In my country S5 is $374 but 16gb is not enough. Xiaomi mi note pro costs 597$ outside China because they think that westerns are accustomed to pay expensive s#|t. I understand all of that. I'm just saying we pay more at the time of purchase than the device is outright worth. That's all I'm saying. For the record, Samsung can do no wrong by me. Well that's obvious. I usually wait 3-4 months for the price to drop. By that time even the manufacturer has recovered many costs, yields have increased and parts become cheaper. Hence the price drops. Let's see a breakdown like that for Apple iPhone. Add in the fact that it make its own software. I think you know what I'm getting at. The phone makes it's own software? All of those same things that apply to any other phone applies to the iPhone, or any device for that matter. There is the cost of parts, assembly, R&D, software development, transport, advertising and support. Any product released will have most if not all of those things figuring into the selling price of the device. As far as software, even though it's handled in house at Apple, they still have to pay them a wage and benefits. Which is what amazes me how they can make so much profit per device, considering what they pay their employees in the US. Even the S5 did cost like 250$ to manufacture. And this one has much more costly internals like LPDDR4 RAM, 14 nm chip, UFS II storage, QHD screen, 2 gorilla glass 4 displays and a metal chassis. Most of them are in-house. So it should be cheaper. But I still believe it should be above 300$. You make no sense. iPhone 6 costs a lot more to make than 1+1. They have to distribute the phone, there's R&D, there's marketing, the processor is better on iPhone and also the camera, the screen is 750p but it's quality is better than 1+1. And all that great tech is fitted into a much more compact body and made with much better precision. Also there is software which Apple makes and updates much more frequently than 1+. OPO doesn't have lollipop yet despite CM12 has been released for ages now. Miniaturization takes effort. That's why tablets with higher specs cost less than phones. iPhone's price is a little high: yes Should it cost less than one plus one: heck no. Google services demand about 40$ per device. Also Samsung has it's own apps and services, and touchwiz + kernel takes up software work. Then there are offers like free 115 GB cloud storage and other free apps with the device, there is customer service, updates in the future and so on.... + the points mentioned above. Even if it cost $1500 I would still get S6 Edge in Green. You could literally say that about anything, so way to state the obvious. But you can't pass these down to your grand kids in 20 years lol! annnnnnnnd why would you even want to do that to them? I can't even imagain where technology will be at in 20 years. but i bet it be nothing like what phones are like now. Lol! You just don't get it.